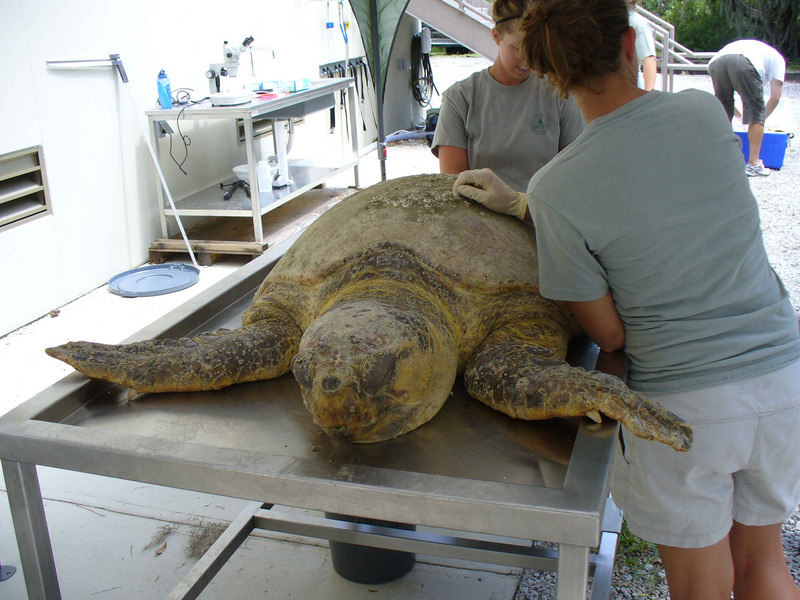 This loggerhead, who was an impressive 265 pounds, was found washed up near Myrtle Beach earlier this summer. At that point, she was still alive but very weak. A local police officer who was a member of the South Carolina stranding network called it in, but she died on the way to the Aquarium’s Sea Turtle Hospital. A team of assembled experts, which included representatives from the South Carolina Department of Natural Resources, the College of Charleston, and the South Carolina Aquarium, was called in to determine what happened to this turtle. They thoroughly examined her both externally and internally. We first checked for external injuries (shark bites, propeller wounds, etc). We also checked for abnormal levels of epibionts like barnacles- while having some is normal, too many can pose problems for these animals. Interestingly, closely examining the barnacle species found on a turtle carapace can provide clues to where that turtle has recently been. 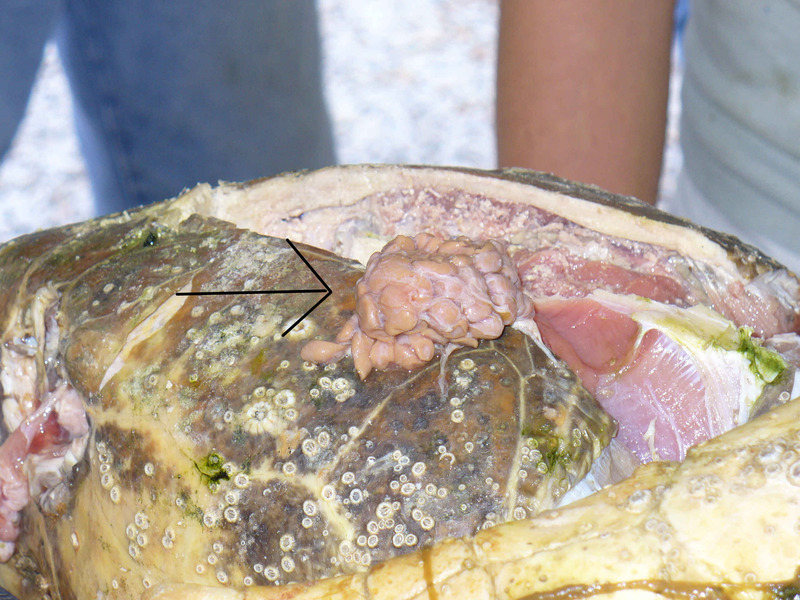 Some turtles even have barnacles living inside their throat! There were no external abnormalities that could account for her death, though she did have marks on her carapace associated with mating. A variety of medical and scientific samples were taken for future analysis. Some will be used to help figure out why this turtle died, and others will be used for ongoing scientific research- since they are a threatened species, it is often considered preferable to sample individuals that have already died rather than stressing out healthy animals. Next, we checked to see if there were any obstructions in the throat (such as fishing gear or plastic) that could have killed this turtle. If food can’t get to the stomach, the turtle will starve. 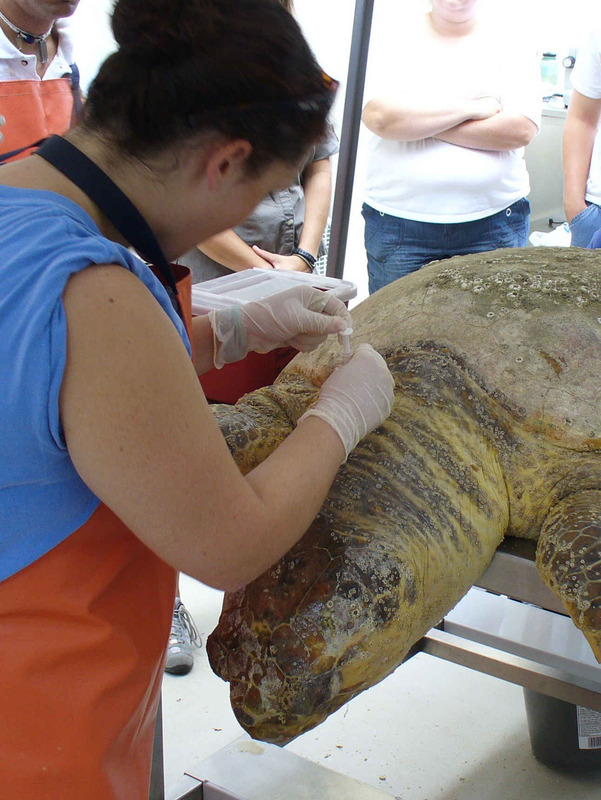 Though this has happened to many sea turtles in the past, this animal’s throat was clean. The glottis, which leads to the lung, can be completely closed off by the turtle during their impressively long dives. 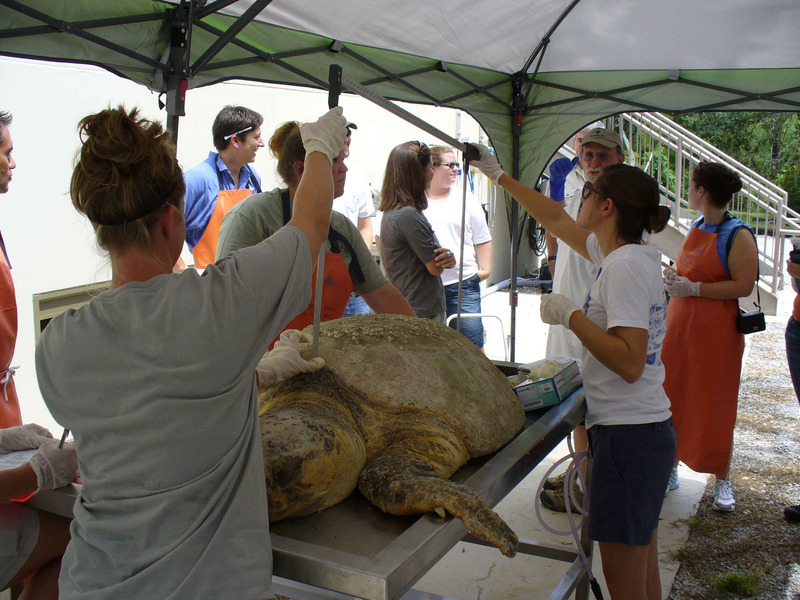 Vets have also been known to force an air tube into it to help a seriously injured turtle. 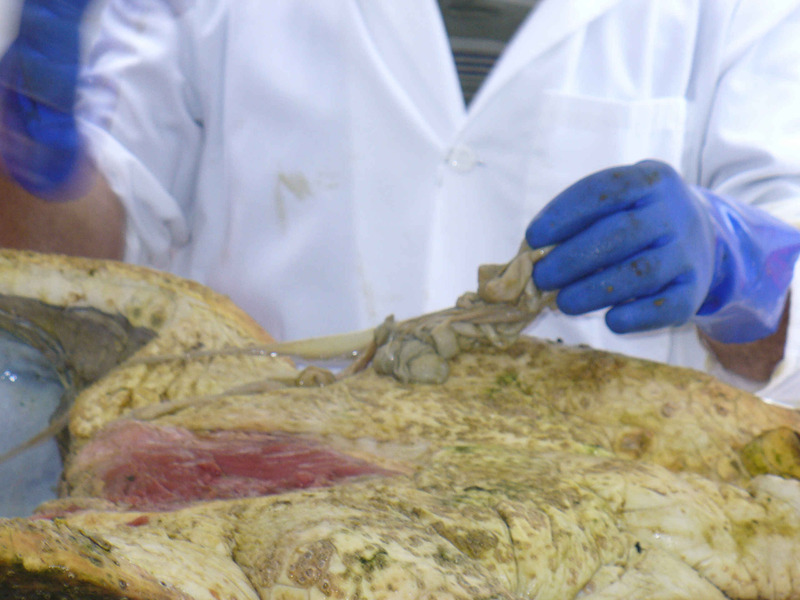 With all the external observations completed, we cut open the plastron and looked at the internal organs. In general, very red muscle indicates a healthy turtle and paler muscle indicates weakness or stress. Since this turtle was frozen, however, muscle color is an unreliable indicator. The team concluded that her muscles were in pretty good shape. An investigation of the joints, which can become visibly inflamed as a result of infection, also revealed nothing out of the ordinary. We also examined her gut contents. 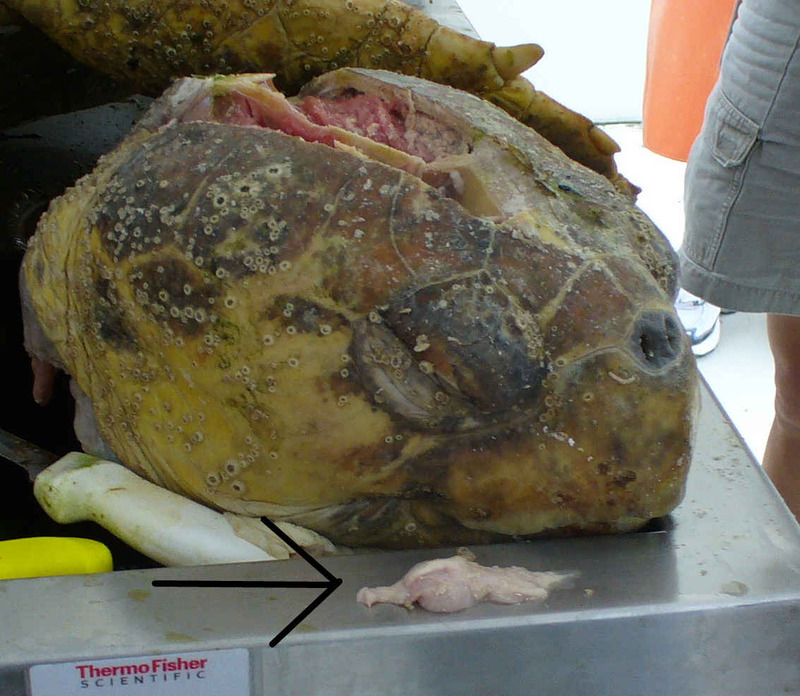 Knowing what turtles eat allows managers to better protect them, and ingesting abnormal items (such as garbage) can sometimes result in death. 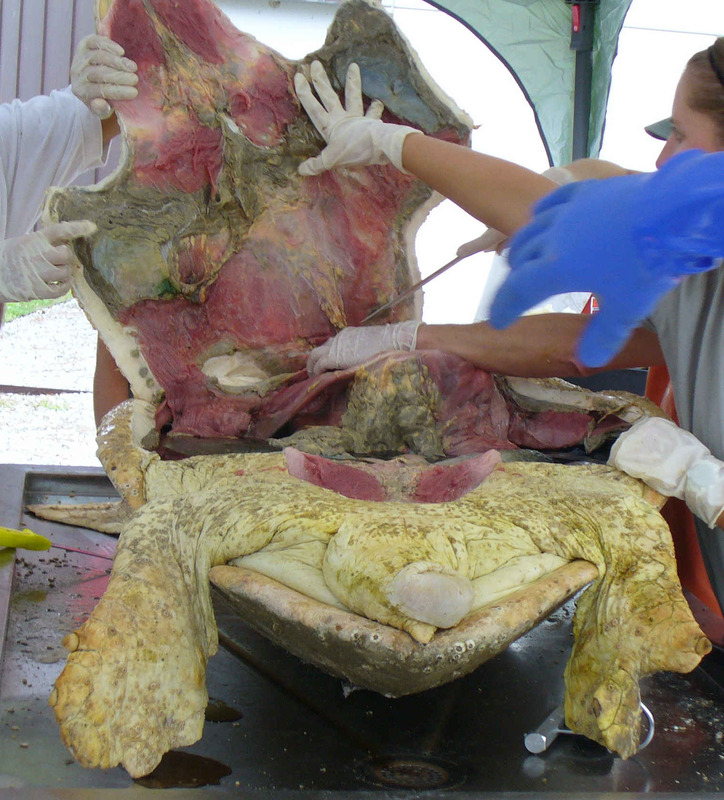 Loggerheads commonly eat crabs, clams, conch, and jellyfish, but this turtle’s guts were almost empty. This may be a clue as to how she died- empty stomachs are rare this time of year. Examining her reproductive tract revealed a mystery. Though this turtle is more than large enough to reproduce, there is no evidence that this occurred in 2010. There was inconclusive evidence of earlier mating, and samples were taken for further analysis. This may be because she was already sick last spring during mating season. 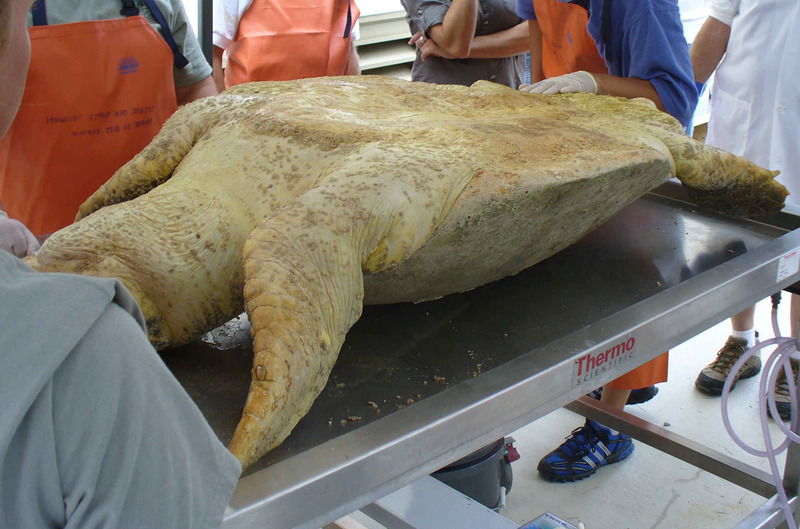 In addition to forensic analysis to determine what happened to this sea turtle, my professor used the opportunity to teach us about their anatomy. The brain was incredibly interesting- although the animal was larger than me, her brain was tiny. These guys aren’t known in the marine world for their intelligence. Larger than (and adjacent to) the brain are the salt glands, which expel excess salt through a turtle’s tears. 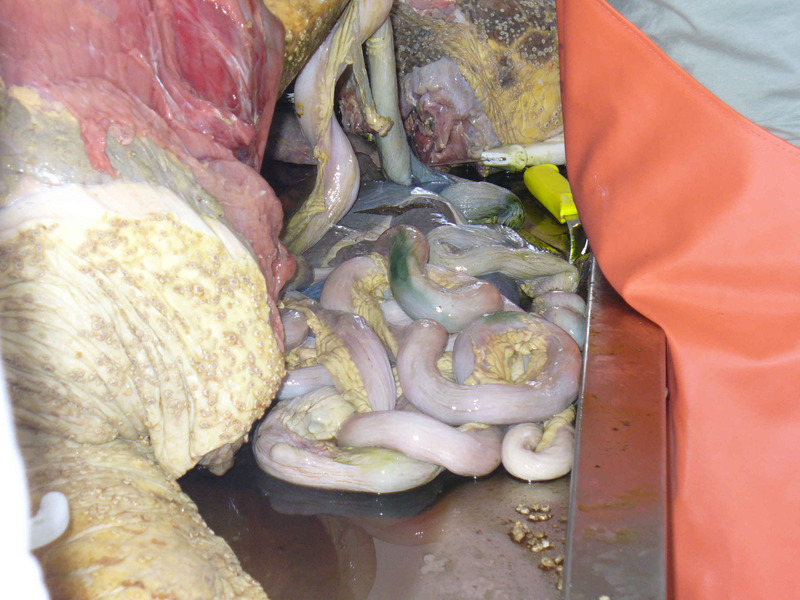 Their convoluted shape resembles a kidney, which makes since because both organs filter body fluids. 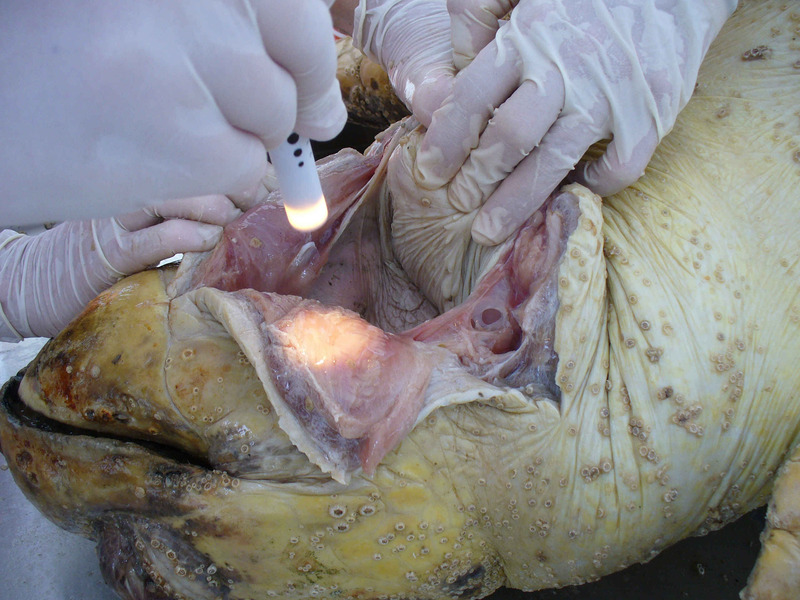 One unique aspect of sea turtle biology is the esophagial papilla. These keratinized spikey projections in the throat allow turtles to deal with the large amount of salt they ingest living in the ocean. When turtles gulp food, they also inhale large amounts of salt water. The papilla allow them to spit out much of the water while trapping the food inside. After the three-hour procedure was completed, we found no obvious cause of death. They refer to these as “DON” turtles- dead, otherwise normal. It’s possible that further analysis of some of the samples we took will clear up this mystery, and it’s possible that we’ll never know what happened to her. We do know that this species faces many threats, and that it’s very important to protect them. More like this: NOAA The Anatomy of Sea Turtles book, free. Hi! Clear and interesting article. howcome some turtles outlive humans, have there been any studies conducted on this matter?